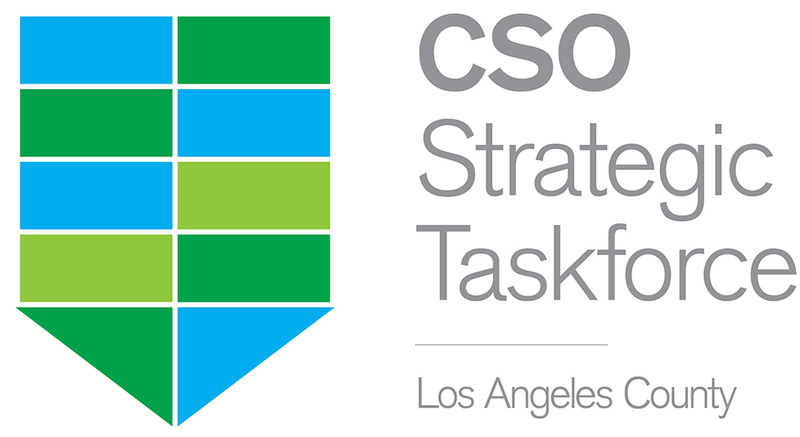 The CSO Strategic Taskforce includes Chief Sustainability Officers from academic, business, and government institutions across LA County and is a collaborative initiative with Los Angeles City Councilmember Paul Koretz. Focus: The meeting focused on how we might take advantage of an opportunity opening up for the summer of 2019: to host a series of high-profile public events focused on key sustainability issues at the soon-to-be-installed SelgasCano Pavilion at the La Brea Tar Pits. 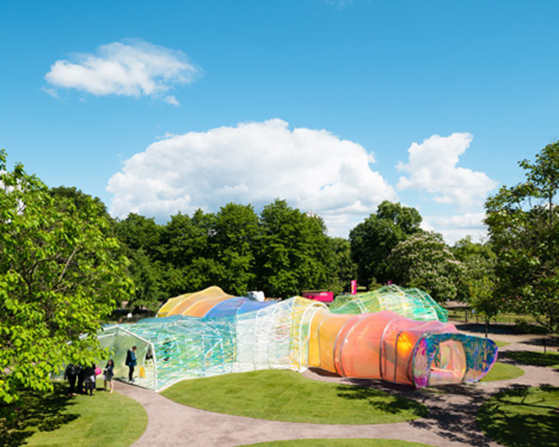 Second Home Serpentine Pavilion by SelgasCano, soon to be installed on the campus of the La Brea Tar Pits. December 13 follow-up meeting was held at Caltech for volunteer members of a working group focused on this event. Tour: SpaceX and Boring Co.
Keynote Presentation: Adam Lane, Vice President, Programs, Los Angeles Business Council. Adam will discuss the intersection of business and sustainability, focusing on three LA examples. 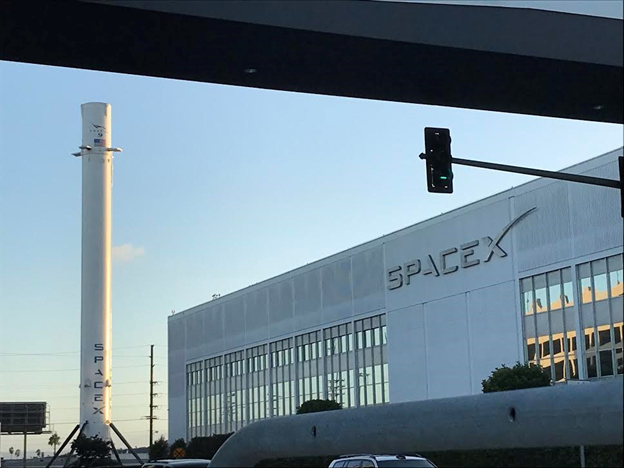 Prior to the meeting, Taskforce members were given private behind-the-scenes tours at both SpaceX and The Boring Company. Keynote: Adam Lane, Los Angeles Business Council Vice President, Programs. Challenge highlight: Andy Shrader, Office of Los Angeles City Councilmember Paul Koretz, on EV charging. Andy created this Google Doc to collect ideas in follow-up to the discussion. Keynote Presentation: Matt Peterson, former CSO of the City of Los Angeles and currently President and CEO of the. He will talk about the work of LACI within the context of City and County sustainability goals. 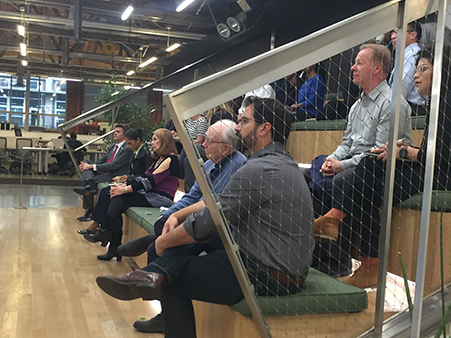 Taskforce members gathered at the LA Cleantech Incubator to listen to former Los Angeles CSO and current CEO of LACI Matt Petersen. Gary Gero, Los Angeles County Chief Sustainability Officer, addressing the CSO Taskforce. LA County CSO Gary Gero keynoted the second meeting of the CSO Strategic Taskforce, offering members a first look at the LA Countywide Sustainability Plan. He then took members’ questions. 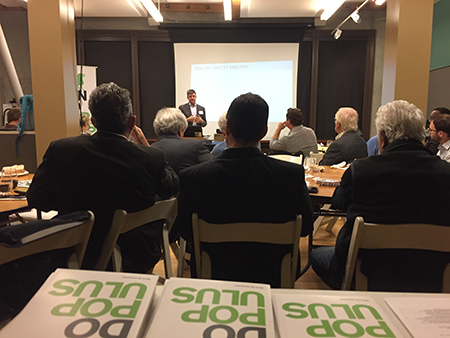 John Onderdonk chaired the evening, and allocated remaining time for two purposes: discussion of an upcoming project that already has keen interest among some members of the Taskforce; and a Think Wrong brainstorming session. Project: Eugene Shirley gave an overview of CITY BLITZ, a new peer-to-peer executive education prototype in sustainability that will target municipalities across LA County. Mike Wallace of BrownFlynn then provided a global to local perspective on sustainability and sketched how CITY BLITZ might fit into Taskforce ambitions to help create a more sustainable County. Think Wrong: Andy Shrader, from LA City Councilmember Koretz’s office, then asked the group for assistance in brainstorming about EV charging in the city. Four breakout groups quickly came up with clever and useful ideas. John Onderdonk concluded by suggesting that the Taskforce appears to have momentum in meeting real needs, and proposing the third meeting be scheduled for late January. Foreground, left to right: Robyn Eason, West Hollywood Senior Planner, John Bielenberg, Future Partners founder and Pando Populus Creative Director, Mark Spears, Walt Disney Company Sustainable Business Practices Director (ret.). 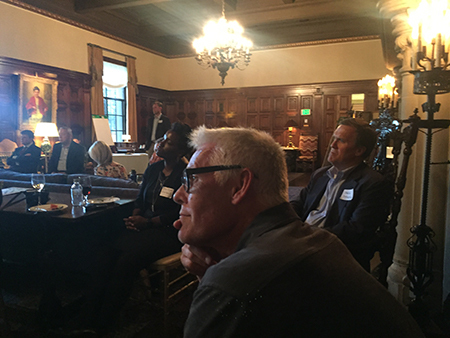 The inaugural event of the Chief Sustainability Officer (CSO) Strategic Taskforce kicked off in Caltech’s legendary Athenaeum with the challenge to “think wrong” about LA County sustainability — given the direction that thinking “right” is taking us. John Onderdonk, CSO of Caltech, chaired the evening and welcomed members to this premiere event. Andy Shrader, environmental policy director from the Office of Los Angeles City Councilmember Paul Koretz, delivered the Councilmember’s greetings. John Bielenberg, a founder of Pando Populus and of the Silicon Valley design firm Future Partners, then facilitated the kind of Think Wrong discussions that he has become known for internationally. Breakout sessions generated specific, small-bet ideas addressing countywide sustainability challenges from waste to EV charging to water. Taskforce members said in post-event debriefings that they were interested in: 1) cross-silo networking; 2) cutting-edge content and best practices; and 3) opportunities to collaborate on specific projects in collaboration with other Taskforce members. They see themselves as a kind of “kitchen cabinet” on sustainability and resource to make key initiatives and events happen. Christopher Hazen, Director of Corporate Development, Enovity Inc.